My biggest difficulty with Extract is that you ultimately must go into the movie with Office Space in your mind. Honestly, it's the only reason I went to see it. Since Mike Judge was able to make such a funny movie once, he certainly should be able to replicate it. Maybe? Not as many people saw Idiocracy. The overall concept was good, I liked the satire, but there were only a few laughs. 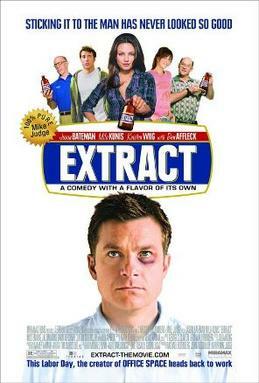 Extract wasn’t that great. Yeah, there were some funny parts, I think. At this point, I can’t remember any. I do remember that this movie also featured a drug trip using camera tricks. In fact, it looked a lot like the one in Woodstock, which I had seen a few days earlier. So my question is – “Is Jason Bateman overrated?” Bateman made his resurgence with Arrested Development. The show was brilliant, and he was great in it. For the most part, he was the straight man to his bizarre family. But he had his share of funny parts. But then when you think about the other movies he has been in since then – Juno, Hancock, Up in the Air – he’s mostly the straight man again. But he isn’t offered a lot of funny in those scenes. And he doesn’t produce a lot either. His comedy seems to be very specifically focused in one direction. So I’m looking forward to the Arrested Development movie, should that ever take off. Of course, I’m completely ignoring the fact that he wasn’t just a Teen Wolf – he was Teen Wolf Too. Extract. Comedy is very subjective. You might like it more than I.